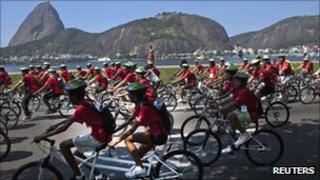 Almost half of Brazil's population is now overweight or obese, a government study has found. From 2006 to 2011, the proportion of Brazilians who were overweight went up from 42.7% to 48.5%. The health ministry described the trend as "worrying", but said it was not a direct result of rising prosperity. It highlighted major programmes to promote healthier eating and increased physical exercise, saying now was the time to confront the problem. The study was based on 54,000 telephone interviews in all the country's state capitals as well as Brasilia. It found that 52.6% of men and 44.7% of women were overweight. The proportion of people with obesity increased from 11% in 2006 to 15.8% in 2011. The health ministry said the consumption of high-fat food was a major cause, particularly among men. But Health Minister Alexandre Padilha rejected the idea that the increase in the proportion of overweight people was linked to Brazil's rising prosperity. "Eating habits have not changed much over the last six years, it wasn't in this period that people started consuming full-fat milk and fatty meat," he said. The health ministry says it is working with major food producers to reduce levels of fat in processed food and offer more healthy alternatives. It also highlighted major spending programmes on health education and sport in communities and schools. "Now is the time to act to ensure we don't reach the levels of countries like the US, where more than 20% of the population is obese," the ministry said. On a positive note, the study found that the proportion of men who led sedentary lives had fallen from 16% in 2009 to 14% in 2011. The proportion of Brazilians who smoke has also continued to fall. Being significantly overweight can contribute to a range of health problems, including diabetes, heart disease and some cancers.